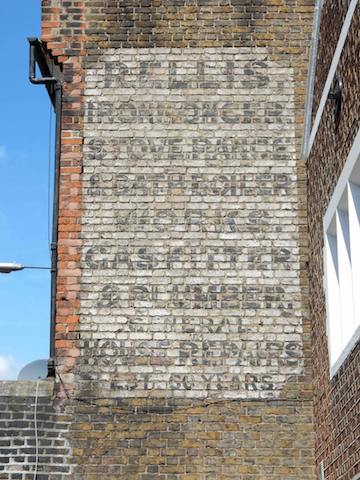 Ghost signs tell a story of London’s economic, social and political history. Sam Roberts began documenting ghost signs in 2006 after the first ghost sign he spotted in Stoke Newington. For me, they are ‘fading painted signs’. Other de nitions exist, many of which include a much broader range of what I would describe as ‘historic’ signs eg moulded plastics, neon etc. 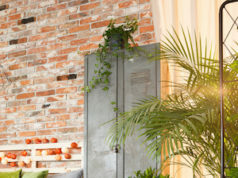 However, these don’t always have the faded, ghostly, aspect, that is what sets these signs apart as ‘ghost’ signs. CAZENOVE ROAD Barely legible now due to the level of fading, the full text of this sign reads, ‘Good Judges Drink John Brown’s Whiskies’, and contemporary Victorian press advertising illustrates the play on words with a picture of two white-wigged judges savouring a glass each. 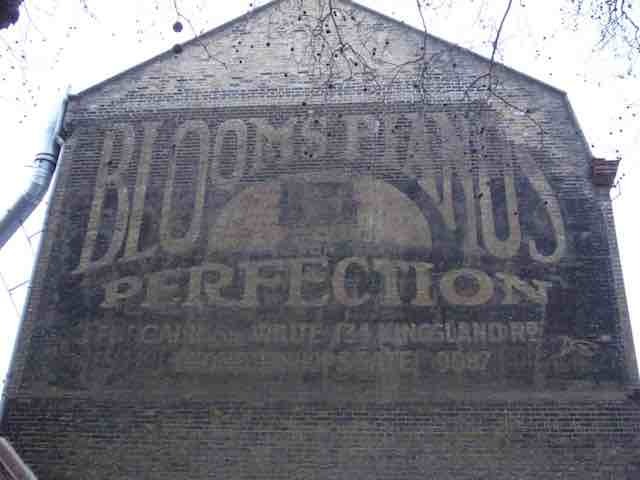 How did you notice and become interested in ghost signs? I became conscious of fading signs on walls in 2006 within the context of my interest in the history of advertising. I was fascinated by the idea of hand- painted billboards once being a viable form of advertising, and the faded aspect suggesting that these relics may not be with us forever. 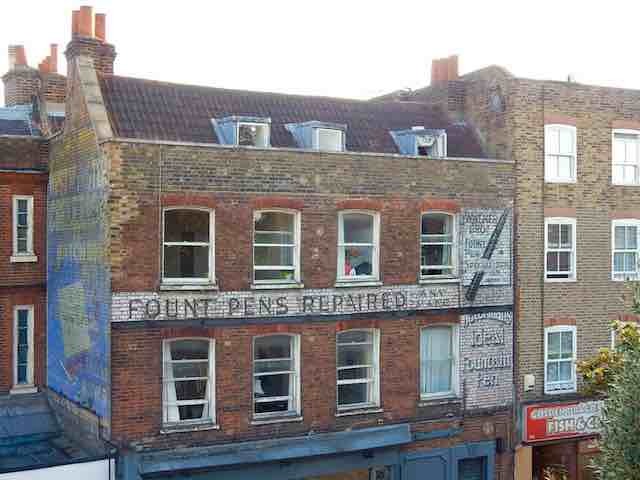 The one that caught my attention also happened to advertise the repair of ‘fount pens’ which seems an alien concept in today’s disposable/throwaway culture. What was your day job back then? At the time I was working for the Institute of Practitioners in Advertising, managing their professional qualifications programmes. KINGSLAND ROAD, DALSTON This locally listed ghost sign takes us back to the time when Shoreditch and Hoxton were a centre for cabinet making, including the manufacturing of pianos. 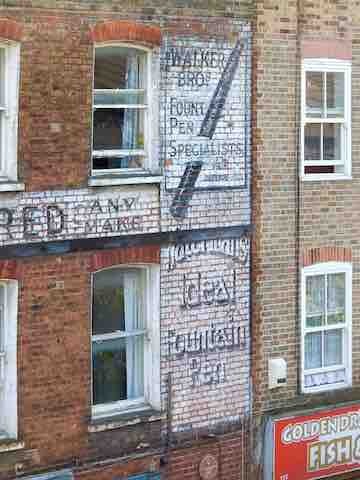 It was painted by a firm called Howell Signs from Clerkenwell. What was the reason for using ghost signs? 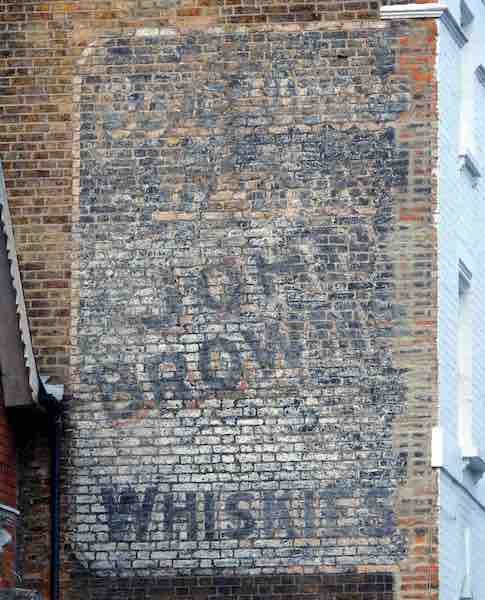 What are now ghost signs were once brightly coloured and full-bodied signs. Most of those that I have been documenting for the last 12 years are commercial advertisements, although paint was used for myriad other types of signage from road names to directions to bomb shelters in the war. 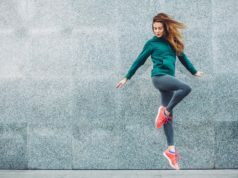 The commercial examples range in purpose from simple shop fronts to large- format ‘branded’ billboards advertising goods and services. 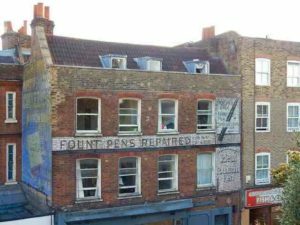 Are the UK and/or Hackney interested in preserving ghost signs? The UK is starting to recognise the historic value of the signs, whereas other countries such as Belgium, Australia and the USA have more advanced movements towards their documentation and preservation. Nonetheless, back in 2012-13 Hackney Council added two signs to its local list in recognition of their “Aesthetic or Artistic” merit. Both signs can still be seen, the fountain pen one on Stoke Newington Church Street, and one for Blooms Pianos, on Kingsland Road. NORTHWOLD ROAD Late-Victorian sign for Robert Ellis’ ironmongers shows how the mortar lines in the brick can be used as grid lines for setting out the lettering on a sign. 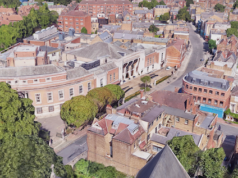 Robert and his wife moved to these premises in 1878 following the tragic deaths of their infants at their previous home and workshop on Stoke Newington High Street. What is your favourite ghost sign in Hackney? It would have to be the Walker Brothers/Watermans one on Stoke Newington Church Street. It dates from the late 1920s and contains lots of features, including an illustrated element that make it interesting. It is the first one I ever noticed, but still captivates me each time I see it. 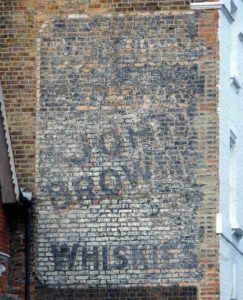 The story of the sign is included on my Stoke Newington Ghost Signs walk which can be downloaded free via the Ghost Signs Tours mobile app. Do you get any business o ers related to ghost signs? to become the ghosts of the future. 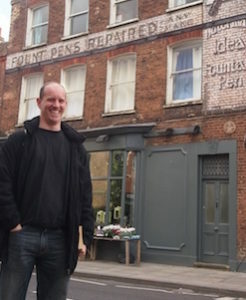 Do you think more should be done to protect ghost signs? to convey their value and historical interest. However, I understand their meaning at a local level so am happy to write a letter of support for those that seek to follow the o cial channels towards the listing and protection of their local signs.